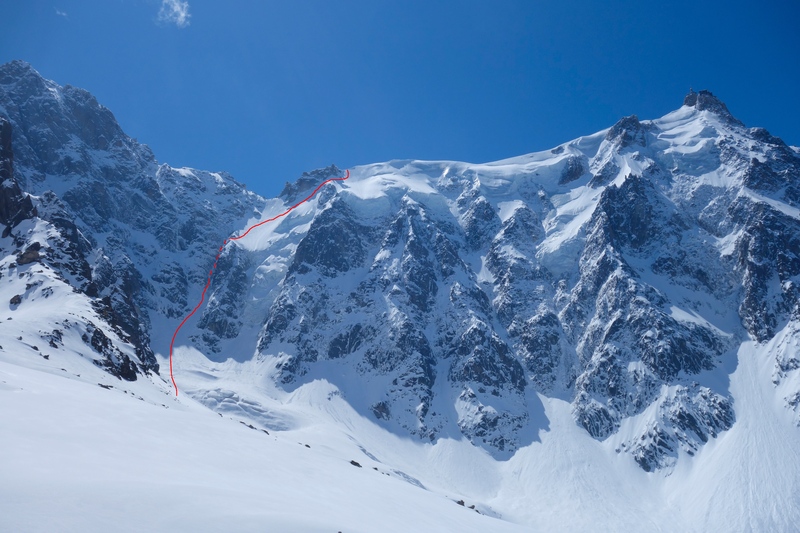 Fifteen months after making my first off-piste turns I find myself clipping my skis on looking down a windy, powder covered arête with a Midi north face line in my sights. Even after the arête warm up my first turns did take some building up to but once they came and went I was committed and ready to enjoy some steep powder. After the short traverse to the Col du Plan main face we encountered a brief icy section. A few instructional words from Dave I was over the difficulties and we had a couple hundred meters of cold steep powder before we hit the rappel. Waiting for the first group to rap we saw Bird coming in direct from the Col. It looked icy and we were glad we came in from higher up. He ripped it up, making huge turns down the face until he arrived with us and asked if he could tag along on our rope as his partners had abandoned him. Not wanting to leave him stranded, we said yes! After the initial two raps there was a short sideslip before the last small rap with skis on and we were out of the danger. I could see the mid station. Some more steep turns then it was smooth powder all the way back. Arriving at the plan with Dave and Bird it was high fives all round. It still has not sunk in that I had skied the North Face. Earlier on in the season I jokingly said to Tom that I would be ripping it up in my second season skiing but I didn’t say it with much confidence and definitely didn’t dream it would become reality. I felt content with my accomplishment and headed back down as those boys went back up with the Eugster in their eyes. Meeting up with them after they ended up skiing a powdery Rond with big turns all the way down. What a day. Thanks to Dave and Bird for the company and ensuring we all made it home.